Cracking Area: Sum of rectangular areas circumscribing manifest distress (line cracks are assigned a width of 0.5 m), expressed as a percentage of carriageway area. Ravelling Area: Area of loss of material from wearing surface, expressed as a percentage of carriageway area. Number of Potholes: Number of potholes per kilometer expressed in terms of the number of ‘standard’ sized potholes of area 0.1 m2. 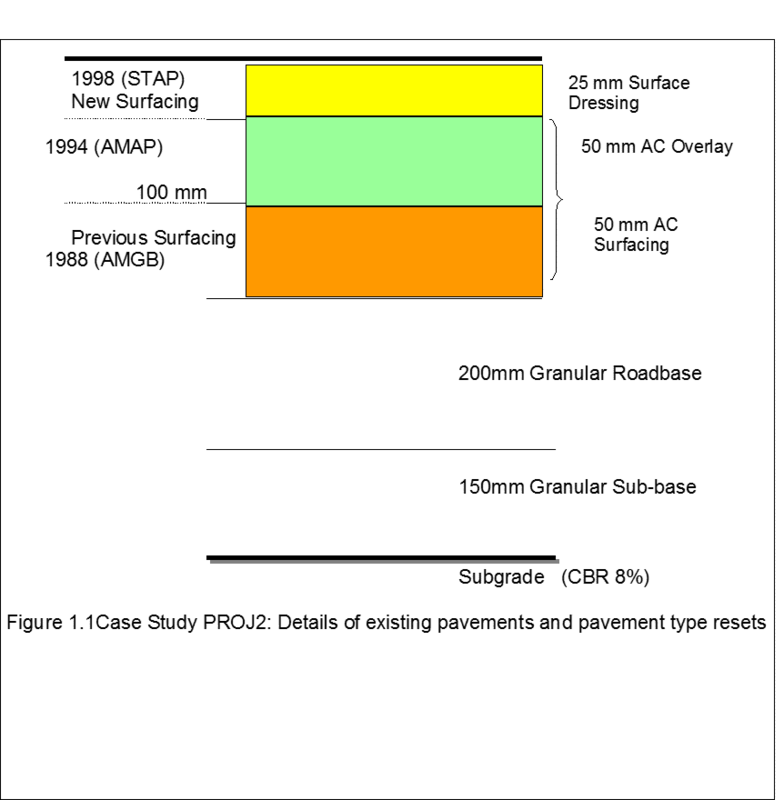 A pothole being defined as an open cavity in road surface with at least 150 mm diameter and at least 25 mm depth.Edge Break Area: Loss of bituminous surface material (and possibly base materials) from the edge of the pavement, expressed in square meters per km. Rutting: Permanent traffic-associated deformation within pavement layers which, if channelised into wheelpaths, accumulates over time and becomes manifested as a rut, expressed as the maximum depth under 2 m straightedge placed transversely across a wheelpath. Roughness: Deviations of surface from true planar surface with characteristic dimensions that affect vehicle dynamics, ride quality, dynamic loads and drainage, expressed in the International Roughness Index, IRI (m/km). Texture Depth: Average depth of the surface of a road expressed as the quotient of a given volume of standardized material (sand) and the area of that material spread in a circular patch on the surface being tested. Skid Resistance: Resistance to skidding expressed by the sideways force coefficient (SDF) at 50 km/h measured using the Sideways Force Coefficient Routine Investigation Machine (SCRIM). 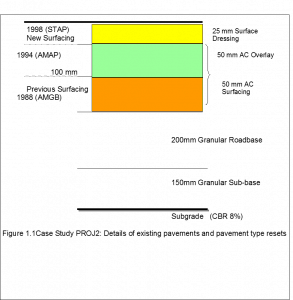 The SNP applies a weighting factor, which reduces with increasing depth, to the sub-base and sub-grade contributions so that the pavement strength for deep pavements is not over-predicted. Structural Cracking: This is effectively load and age/environment associated cracking. Transverse Thermal Cracking: This is generally caused by large diurnal temperature changes or in freeze/thaw conditions, and therefore usually occurs in certain climates. For each type of cracking, separate relationships are given for predicting the time to initiation and the rate of progression.